You need a custom walker for the nav menu. The class Description_Walker extends Walker_Nav_Menu and changes the function start_el( &$output, $item, $depth, $args ) to look for $item->description. 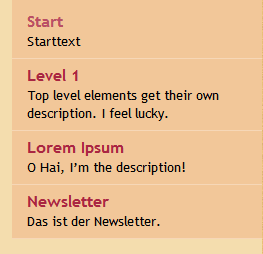 * Create HTML list of nav menu items. * Replacement for the native Walker, using the description. instance of stdClass. But this is WordPress. Now enable the description field in wp-admin/nav-menus.php to get the ability to edit this field. If you don’t WP just trashes your complete post content into it. Since WordPress 3.0, you don't need a custom walker anymore! This isn't better or worse than other suggestions; it's just different. It's short and sweet too. It would also be easy to use jQuery to append it, but the text is ornamental enough that CSS seems appropriate. Not the answer you're looking for? Browse other questions tagged theme-development menus walker or ask your own question. Add Menu items description via Custom Walker for wp_nav_menu()?